I was walking down the street and I met a person. Somehow we got into the discussion of the existence of G-d. They were a foreigner but spoke English. I mentioned that it is easy to prove the existence of G-d.
Easy enough. One need not be a rocket scientist – to understand that logic. She and her friend half-heartedly acknowledged it. Her friend did believe in G-d. I pointed to the building behind and asked do you think this building was built with bricks flying together. I proceeded to explain that there are four questions that through rationality and logic anyone can come to the conclusion that the true law of G-d is the Torah. 4. No. Rationally, It doesn’t make sense that G-d, who knows all, is omniscient – knows past, present and future, is the most intelligent existence, will change his mind about His people or His laws. She raised some objections but they were easily answered away. Then she dropped her “bomb” question. Can G-d Create a Rock He Cannot Lift?. Before answering it – I’ll preface by saying it is important for all people to know themselves. To know what is driving them. To want to seek truth. Many people say they seek truth but it is not so. They seek to justify their behavior. Why do people pick on the “goody-goody”? Because he makes them feel guilty that they are not living up to the standards they intuitively know that G-d wants from them. So instead of making the effort to improve – they put down the goody-goody. Not improving and basically fooling themselves. Thus it is of utmost importance for a person seeking true self-improvement and connection with spirituality to have this motive of searching for truth. Willing to give up my lifestyle for truth. Others have a lifestyle that they want to pursue and they seek to find the “truth” that suits their lifestyle. A religion that allows me to do what I want. This is the real reason for anti-semitism – pick on the Jews because the Jews remind me that G-d wants me to be better. Hitler said it straight out – in Mein Kamf – “the Jews brought two problems to the world circumcision – [recognition that man is not perfect and we must make an effort to better ourselves – in short the pursuit of perfection] and the conscience [the belief that G-d is watching our actions].” To deal with it – Hitler – instead of trying to improve himself – he committed genocide. He wanted the earth to be a world of “civilized acting” barbarians. This is the reason why many deny G-d. If I deny Him I don’t have to feel badly about doing wrong. A mature person takes responsibility for their actions and tries to improve when they missed the mark. G-d accepts their repentance. G-d allows them to wipe the slate clean. Even scientists like Stephan Hawking and others fall into the trap. Ask Stephan – Come on the whole world, all nature, growth and movement, life all caused by random atoms? Not rational. I’d expect more from you Stephan. The drive to cover up truth as long as I can do what I want is strong. Strong enough to blind scientists. Strong enough to cause people to support BDS and company. Strong enough for people to justify terrorism. Strong enough for the UN to make over 220 resolutions against Israel and remaining silent for atrocities in the rest of the world. Logically it makes no sense – but given the interest of justifying one’s behavior and avoiding having a guilty conscience – it all makes sense. It happens to all of us. It happens in Judaism. The whole reason for the initial development of the reform, conservative, reconstructionist “movements” is because they want to justify doing what I want while not feeling guilty. It is irrational – to think that G-d given laws can be nullified by man. I’m not trying to blame the world. But just pointing out that this will – to avoid feeling guilty for one’s bad actions – is a real driving force in the world and in the individual. Thus – we pray to Hash-m to help us find truth. OK. So the answer to the question. 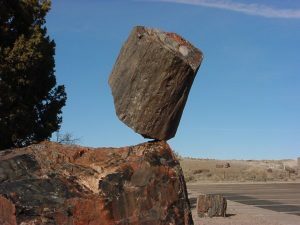 Can G-d Create a Rock He Cannot Lift? the answer to both is – NO. G-d is all powerful. He can do whatever he wants. You say G-d is all powerful and has no weakness. The answer is – G-d is all powerful. He can do anything. But not being able to create a rock that He cannot lift is not a weakness – it is a strength. Not being able to be destroyed is a strength – not a weakness. Let’s put the answer in positive terms – Any rock that G-d creates – He can lift. G-d cannot be destroyed. Those are both strengths – not weaknesses. If we compare our existence to the pixels on a computer screen and G-d being the Programmer – just like the programmer can program whatever he wants – G-d can do whatever he wants. She then asked another “bomb” question. If G-d created the world – who created G-d? That answer is also basically simple to answer. G-d always existed. No one created G-d. G-d created time. We live in a world that time is an integral part of existence. G-d created time. G-d did not just create the world and leave it on autopilot. G-d is creating the world and recreating it every second. Like pictures in the old movie reels. So it seems to us that there is time. But G-d is out of the world of Time. Rabbi Ela’zar says: Be diligent to learn Torah and know what to answer to the non-believer. And know before Whom you toil and that Your Employer is trustworthy to pay you the reward of your labor. It’s good to know the answers – but you don’t have to go out and debate everybody now – it is good enough for you to know the answers yourself. It seems that the Mishna above is telling you – if you will be influenced to deny G-d because the deniers promise you living a life – guilt free by denying the existence of G-d – that lack of guilt is no way worth the great reward and tremendous pleasure – in this world and in the next world (heaven) – in serving G-d. This entry was posted in Emunah - Faith in G-d, Truth by admin. Bookmark the permalink.